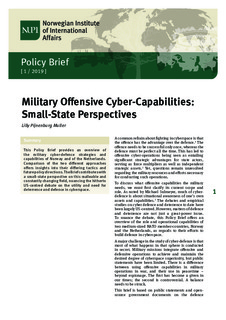 This Policy Brief provides an overview of the military cyber-defence strategies and capabilities of Norway and of the Netherlands. Comparison of the two different approaches offers insights into their differing tactics and future policy directions. The Brief contributes with a small-state perspective on this malleable and constantly changing field, nuancing the hitherto US-centred debate on the utility and need for deterrence and defence in cyberspace.